Line and 8 by 8 inch cake pan with foil and spray with spray oil. Preheat the oven to 350 degrees F.
Beat the butter, sugar, and vanilla. Add the eggs, beating them in one at a time. Whisk the dry ingredients together and then slowly add them into the wet ingredients, stirring by hand. Beat the cream cheese and sugar with a hand or stand mixer. Beat in the rest of the ingredients. Spread 2/3 of the brownie dough into the foil lined pan. Spread the cheesecake batter on top. Take the rest of the brownie batter and create three stripes on top of the cheesecake batter. 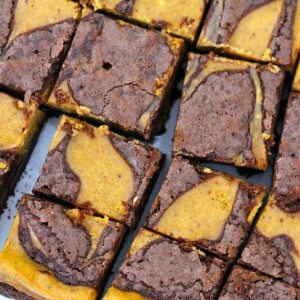 Take a butter knife or spatula and run it in swirls through the brownie and cheesecake batter to create a fancy pattern. Bake for 35 minutes, until the center is firm. Cool completely in the pan, cover with plastic wrap, and then place in the refrigerator. Once the pan is cold, lift the foil with the brownies in it, place the 8x8 inch square onto a cutting board, and cut into whatever size squares you prefer. Store any leftovers in the refrigerator. This post was originally published on November 30, 2016.